Under agpl in devloping on github! 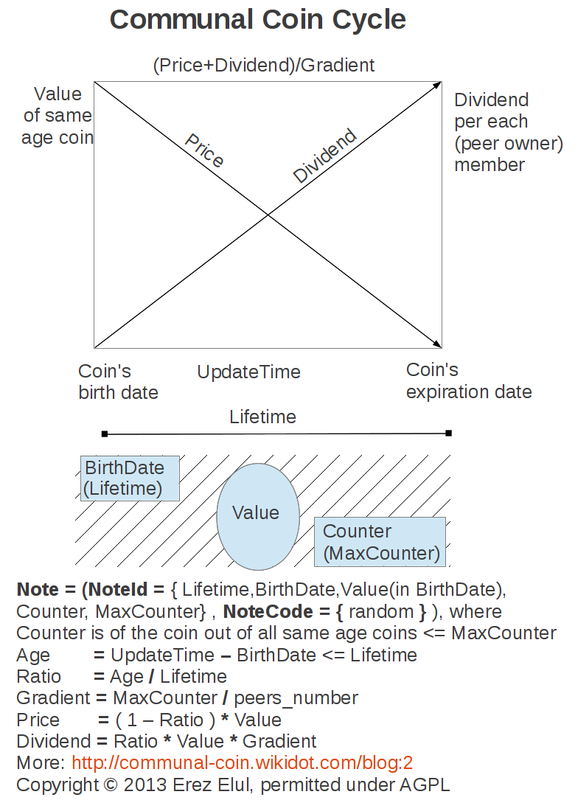 CommunalCoin constantly lose its value in time as each member in the local (using coin) community constantly gets an equal dividend offsetting the lost value of the coin in that system and hence the shorter is the lifetime of the coin the better is the distribution in that system. It is designed for use, within and between bottom up organizations, as a value of gift or rewarding, which is also able to be re-given (as is the case in payment), for to compensate, share thankfulness and/or respect. as is the case in printing local money or in transferring loans, exchangeable for work or production, in manipulated interest levels. C) The well distributed dividend is like injecting bottom-up some clean instance (like water) for having the volume (or height) of the medium be unchanged or somewhat controlled, as is the case in printing local money. in which the members are long lasting members, as they are staying to get the redistributed dividend and normally, in a comcomized community, are also peer (equal) owners of the resources of that community. additionally it uses the swapped gate function of a peer, for additional protection against fraud hacked key/hash.